House Clearance London - Get Your Home Decluttured Today! Out with the old, in with the new! House clearance in London is the ultimate test of removal proficiency. When push comes to shove, Rubbish Begone is always there to show you there’s a better way to handle things. Out-and-out House Clearance in London. 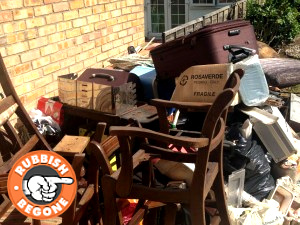 House clearance is the service you book when traditional household rubbish removal is not enough and you need a more radical solution. When everything needs to be discarded from the property for one reason or another. Imagine how much time and effort all of that takes. And now imagine how much of it you save yourself when you allow us to perform the house clearance service for you. Most Dependable House Clearance in London. At a Reasonable Price. If you’ve ever found yourself in a position where you require complete house clearance in London, then you know why this service is so needed. Dealing with the council is a complete nightmare and you have to do all the labour yourself. Same with hiring a skip – you do everything yourself, you need to get a permit for it, arrange for transportation, and it’s overall really inconvenient. Rubbish Begone offers you an easier way. All you have to do is book our home clearance services in London or Greater London and we’ll handle everything for you. That’s right – everything! From labour, through transportation, to disposal. Like with all our other services, the disposal will include as much recycling as possible. We are environmentally responsible and make it our mission to do everything in our power to pay our dues for a more ecologically-sound world. Inspired Convenience. One House at a Time. Our home clearance services in London give you an unrivaled level of convenience. Our lines are open 24/7, so feel free to call our operators any time you want. It doesn’t matter if it’s early morning, late afternoon, or midnight – there is always someone to answer your call. Rubbish Begone is right beside you in your moments of need. We cater our service to you, not the other way around. You can feel free to book us after-hours and we’ll arrange a home clearance. We’re sure you have better things to do than deal with domestic clearance, so why don’t you enjoy yourself while we handle the hard labour? …that there have been numerous reports of found artefacts after a house clearance? Many of them were quite exciting and held a high value! Our job can be quite exciting at times. Do not hesitate to call and book our domestic clearance services in London today. Without delay. Call 020 3404 1106 and book our exceptional London house clearance service now – take advantage of our competitive prices. Alternatively, you can schedule any service provided by Rubbish Begone online as well!